Kristen earned her B.S. in Exercise Physiology as well as her Doctorate in Physical Therapy from UMass Lowell. She has experience working with a variety of orthopedic and neurological conditions in both outpatient and acute care settings. 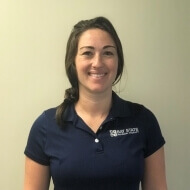 Kristen’s clinical interests include working with athletes, knee injuries, and older adults. As a high school athlete, Kristen sustained numerous injuries over the years. Most notably, she suffered an ACL and meniscus tear during a soccer practice and underwent ACL reconstruction surgery. This led to her passion for the rehabilitation process and helping players return to sport. She believes that exercise is the best medicine and the key to rehabilitation and injury prevention. Kristen works with the patient to identify their needs and goals for physical therapy, then builds an appropriate treatment plan. She focuses on individualized exercise programs, manual therapies, and neuromuscular re-education. Kristen sees patient education as a necessary tool to empower patients in caring for their bodies beyond physical therapy. Kristen sees our aquatic patients 2x a week in the pool at the Burbank YMCA in Reading. Kristen stays active by playing soccer, running, and strength training. In her free time, she enjoys spending time with family and friends, and relaxing on the beach.